UMATILLA - The Nyssa Lady Bulldogs defeated the Umatilla Vikings 52 to 46 on Friday, January 30, 2009. 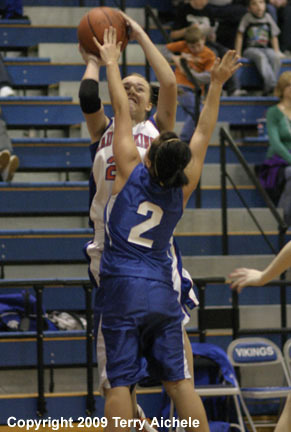 The Lady Bulldogs had a strong defense and Marisa Gonzalez, their point guard had a good game. The Vikings closed to within three points on the Bulldogs at several occasions late in the game but they could never overtake the Dawgs. The Vikings only lead came in the opening minute of the frist period when they led by a score of 2-0. The Dawgs immediately took the lead with a three pointer by Marisa Gonzalez. The Vikings stayed within two most of the first until the Dawgs hit a shot with two seconds to go to take the 14-10 lead at the end of the first. 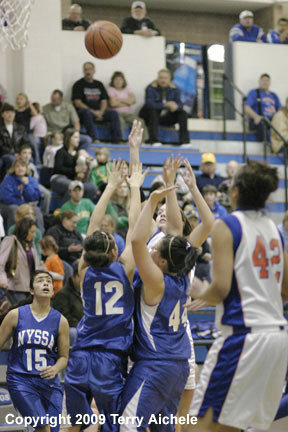 Nyssa outscored Umatilla 10 to 7 in the second period. Scorers in the second for Nyssa included Amanda Bittinger, Lacey Jones, and Becky Hernandez. Scorers for the Vikings included Naomi Castanon, Kassie Kennedy, and Ashley Vandever. Nyssa led at the half, 24 to 17. Umatilla outscored Nyssa 16 to 14 in the third but the Dawgs still led by five at the end of the third. Catherine Routson of Umatilla scored first in third on a fast break. Other Vikings scoring included Jessica Vandever, Katelynn Cranston, Kassie Kennedy, and Castanon. 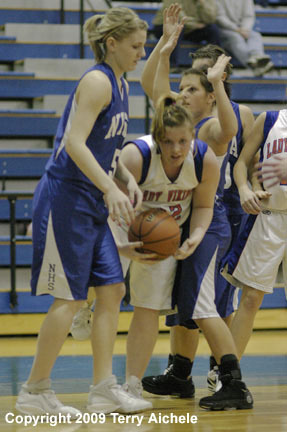 Scorers for the Dawgs included Katie Booth, and Lacey Jones. Nyssa led at the end of the third by a score of 38 to 33. Umatilla came out strong at the start of the fourth scoring five points while holding Nyssa to just a freethrow in the first two minutes closing to within one at 38-39. Then Marisa Gonzalez hit a shot and snapped the Dawgs offense out of their sluggish fourth period start. Other scorers for the Dawgs included Amanda Bittinger, Breona Bittinger, and Karina Armenta. Viking scorers included Catherine Routson, Brittney Quintana, Lindsey Harris with a trey, and Castanon. Nyssa won 52-46. Nyssa's defense closed down the lanes and kept the Vikings taking higher percentage shots. It seemed like the Dawgs guard Marisa Gonzalez was everywhere. The Vikings were in the game, but Nyssa was just had that little extra on Friday night. 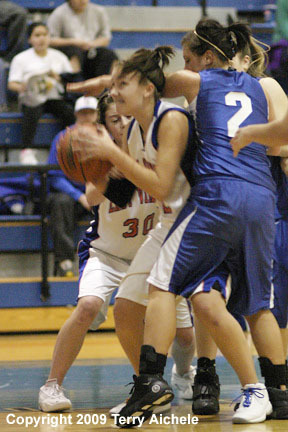 LEFT - Kaitlin Kennedy of Umatilla tries to work her way through two Nyssa defenders. 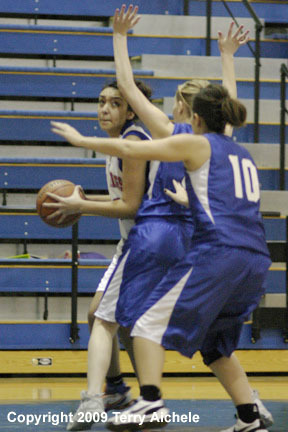 RIGHT - Naomi Castanon looks for a teammate to pass to while being double teamed by Nyssa defenders. 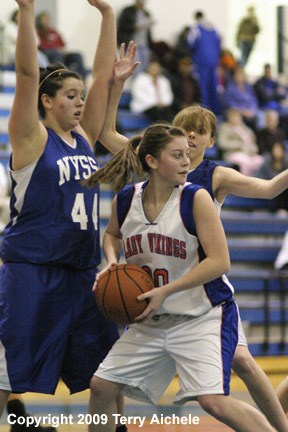 LEFT - Two Vikings battle for control of the ball with a Nyssa defender. 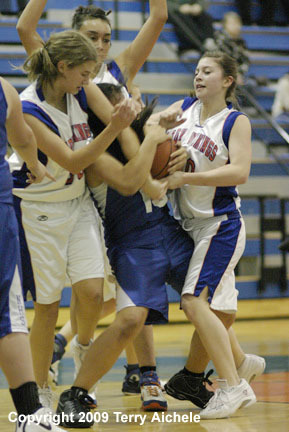 RIGHT - Kassie Kennedy of Umatilla is surrounded by Nyssa defenders including Karina Armenta. LEFT - Naomi Castanon of Umatilla is guarded by Karina Armenta of Nyssa. RIGHT - It's difficult getting a good shot when Vikings such as Jessica Vandever is guarded by two Nyssa players like Lacey Jones and Karina Armenta. 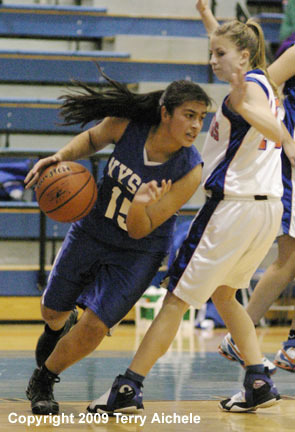 LEFT - Freshman guard Marisa Gonzalez was a standout player for the Bulldogs in the game on Friday. 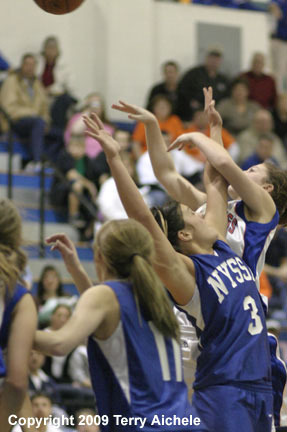 RIGHT - Kassie Kennedy of Umatilla gets a shot off over Nyssa defenders Amanda Bittinger and Katie Booth. 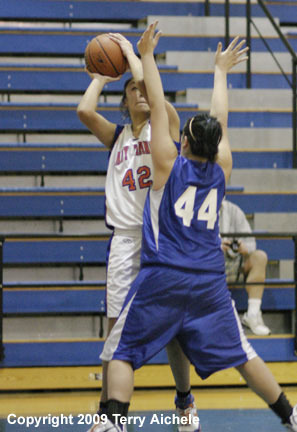 LEFT - Jessica Vandever of Umatilla takes a shot over Breona Bittinger of Nyssa. 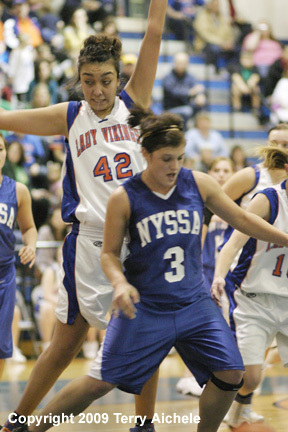 RIGHT - Viking Jessica Vandever drives past Breona Bittinger of Nyssa on her way to the basket.